Looking for Package Deals to Laughlin? We have those too! Rising majestically from the shores of the mighty Colorado River, Laughlin is fast becoming a leading golf destination in Nevada. When Davis Dam was built in the 1950's, it created Lake Mohave, a prime water-recreation spot. After Don Laughlin opened his Riverside Resort three decades ago, other hotels began to pop up along the riverbank. Today, nine hotels occupy the heart of town and about five million people visit Laughlin each year. When it's time to tee it up, there are four scenic courses from which to choose. 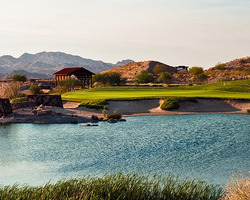 Three of the four courses are situated on or near the Colorado River and offer picturesque river views or mountain vistas and challenging championship-calibre golf.